The first picture I am sharing this week is one of a few that I purchased recently through ebay. It's the best picture in my entire collection of the Bandon City Hall before it moved to its new location in 1970. 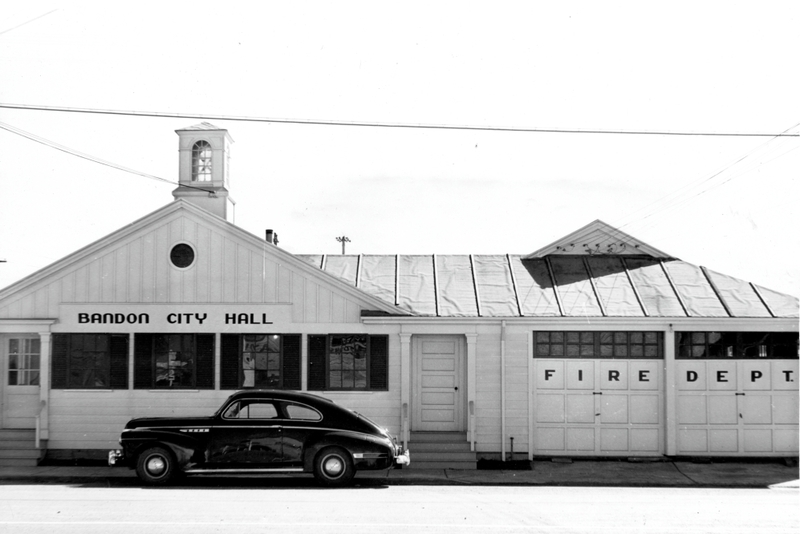 I'm not sure when this picture was taken, but the Buick in front of City Hall is from the 1939-41 era, according to a reader that I go to with vehicle-era questions. The 5x7 original was apparently a news photo, because on the back is taped a caption, which reads: "Bandon's city hall, remodelled (sic) this year, was built as a temporary structure by the WPA shortly after the fire. It was intended to last only until rosy dreams of a planned city, built with federal financial assistance, had materialized. The dream blasted, Bandon remodelled the hall." It's hard to believe that this complex held the city hall, library and fire department (with a couple of sleeping rooms), as well as the council meeting room. Today, this is the home of the Bandon Historical Society museum, which has recently remodeled the exterior of the building. The second picture, which came from the same ebay source, is also an old news photo, because it too has a caption stuck to the back. It says: "Plucky victims of Bandon fire rebuilt their home town into one of the most progressive communities on Oregon coast. It is a center for lumber industry and growing cranberries for U.S. dinner tables." It is stamped with the date of Sept. 2, 1956. This was taken from the hill above Old Town, looking down at the intersection of Alabama Avenue and Second Street. 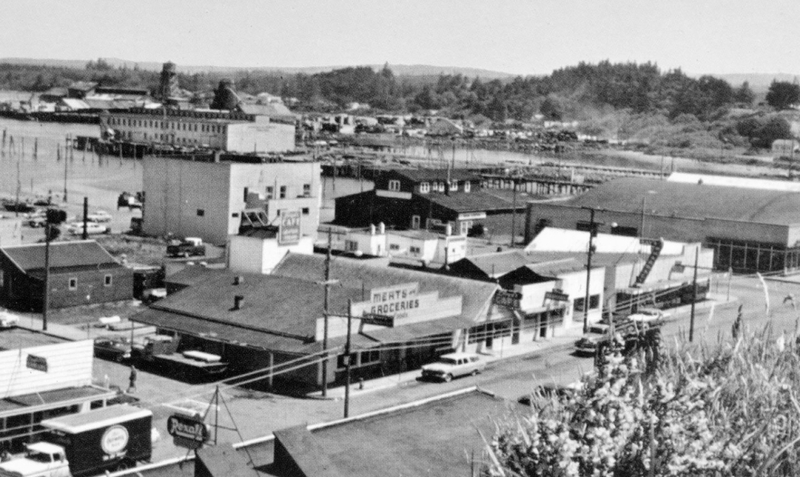 The site where the M&L Grocery is in this picture is now the parking lot for The Minute Cafe, which is pictured next door. Next to it is The Golden Rule (now the Continuum Center) and you can just see the sign for Croxall & Perry Grocery (now a building owned by the Elliott family). Behind M&L is the building occupied by accountant W.H. Johnston for many years. Today it is owned by Ed Landucci and leased to Olivia Andor who owns Olivia's Cottage. It's also hard to miss the parking meters along the sidewalk-less street in the foreground. Ordinarily, I would share a "people" picture, but this week I am going to share a picture from the next block, with Croxall & Perry Grocery in the foreground across from the Rexall Drug Store (now Winter River Books). Across Baltimore from Croxall & Perry Grocery is Erdman's grocery (Meats and Groceries), which is now the shuttered Lloyd's Cafe; next to that is the first Lloyd's Cafe, The Pastime Tavern (now Bandon Sweets & Treats), Boone's Hardware, Ray's Pharmacy and The Senter Agency, now shops owned by Lynn Davies and her daughter Jessica Brink. You can also see the Capps Motor Co. building (now owned by Kirk Day and housing Broken Anchor, Washed Ashore and a real estate business). One of the biggest improvements has to be the building behind Erdman's, which at one time housed Larson's Cleaners and over the years a number of businesses. It has now been beautifully remodeled. Sorry to say I don't know who owns the building or what their ultimate goal is, but I had heard that it might open as a garden shop of some kind. 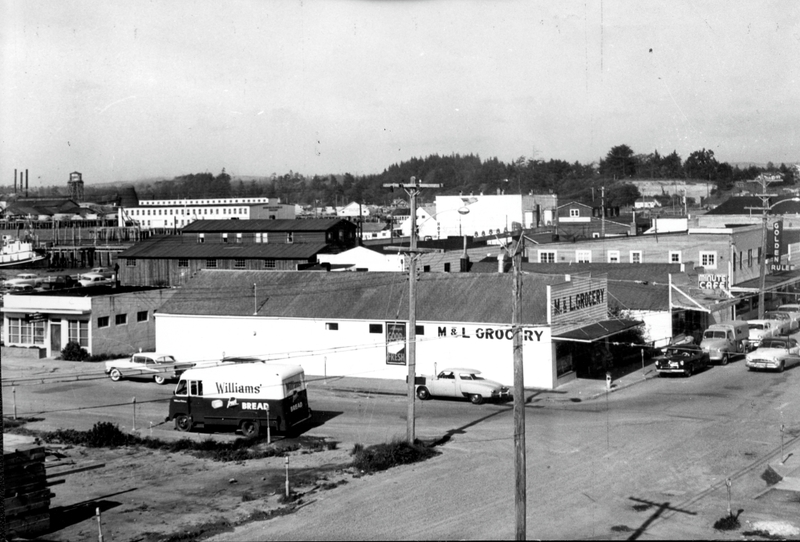 In both pictures you get a good view of the old Moore Mill Truck Shop, which has long since been torn down by its last owner, the Port of Bandon. I told my readers that Robert and I were meeting with three ODOT officials last week, and I have good (make that great) news to report. At least one of the ODOT engineers will be at the May 6 council meeting to share the news with the public. What they have agreed to is to move the 9th Street crosswalk to the north side of the street, and add a short refuge island. As a result there will be poles on either side of the highway where a pedestrian can push the button and activate yellow warning flashing lights. There will be flashers under each sign on the sides of the street and in the middle where the island is. ODOT's Darrin Neavoll described the lights as "very fast flashing and bright. They will stay on for the amount of time somebody walks across plus a little buffer time. The lights will not come back on until somebody pushes the button again." I talked with Bill Caldwell, manager of McKay's, who was fine with the proposal, which will mean that instead of turning into the alley behind McKay's from the center turn lane, large trucks will now turn from the inside lane. But since there will continue to be two lanes on both sides of the highway, traffic should not be impeded. The cost of this configuration is about $80,000, with the state to pay half the cost. Because the City of Bandon is facing big problems in our water and sewer accounts, I have agreed to spearhead fundraising of the other $40,000, with the help of Lori Osborne, who volunteered to assist me. I have pledged $2,000 toward the effort, and Bill Caldwell already said McKay's would also contribute. I have talked with Sgt. Lynch about stepped up speed enforcement, which is another problem along that stretch of highway, particularly in the summer months. Better a speed trap than a speedway. Hopefully the 9th Street crosswalk upgrade will take place by September when school opens, but at least we know it's coming. I was shocked to learn that Robin Pruitt, wife of Jim Pruitt, had died in her sleep Monday night. Robin and Jim had just celebrated their wedding anniversary a few days earlier, with wonderful photos posted on Facebook. I am not sure how old Robin was, but my guess is she was in her late 50s ... way too young to die so unexpectedly. She had a large extended family, among whom were the Senn brothers, Daniel and Bobby, as well as her mother-in-law, Nita Batson, and Jimi Pruitt. I also learned this week of the death of Dean Van Leuven, valedictorian of the Bandon High School Class of 1951 and a star athlete. My sister Molly lost her good friend, Jackie Orsi, last week, at the age of 64. Jackie and Tom had purchased a house here a few years ago, and she was active in her book club and in assisting non-profits like the museum with grant-writing efforts. She had been diagnosed with pulmonary fibrosis four or five years ago. In addition to Tom, she is survived by two adult daughters. People are reminded of the free household hazardous waste collection event at Beaver Hill Solid Waste Disposal site this Saturday, April 27, from 9 a.m. until 1 p.m. Call 541-396-7624 to make an appointment. Best time to call is Tuesday through Friday between 9 a.m. and 1 p.m. I've learned that the driver of the silver car, which landed on top of the SUV in the 42S sinkhole, was the son of Christy Wright (Gallino), Riley Smith, 18, of Myrtle Point. His passenger was Kristin Weekly, also of Myrtle Point. The girl hit her head on the dashboard, causing two black eyes and a hematoma on her forehead. Both were taken to the hospital by ambulance. They were traumatized but not seriously injured. The SUV was driven by Tommy Hunter of Powers. The first picture I am sharing was taken May 27, 1971, after a serious odor problem developed at the city's new sewage treatment plant. Bill Donahue, who was city manager at that time, explained that the smell resulted because of failure of the sludge, produced by the plant, to dry properly. The crew in the photo, which included Don Dodrill on the backhoe, and Don Pierce, back to the camera, were busy removing the sludge, which was then tilled into the soil by a landscaper to take care of the problem. Others pictured, although you can't see their faces, are Bob Hiley and treatment plant operator Ed Ward. I can remember a number of times over the years when those of us who lived near the plant would be "treated" to the terrible smell, but that hasn't occurred in a number of years, which is good. But while we are on the subject of the treatment plant, it is important to remind people that the only thing that is allowed to be flushed down the toilet, besides the obvious, is regular toilet tissue ... not Kleenex, wipes, dirty paper diapers or anything else. The rags, as they are referred to, clog the pump and require a costly shutdown to remove them from the system. Often, you will see that packages of wipes are said to be "flushable." But that is not the case. Our treatment plant is more than 40 years old and simply can't handle the added load. And it's a costly fix. I love this second photo, which was taken from what would now be the front lawn of City Hall, looking north toward town. You can see what is not there, including Peggy Backholm's Bandon Inn and Fred Carleton's office and commercial complex. And if you're able to blow up the photo, you will see the Moore Mill truck shop, Moore Mill, Capps Motor Co., and the sign for Lloyd's Cafe, all things that either are no longer there or the use has changed. 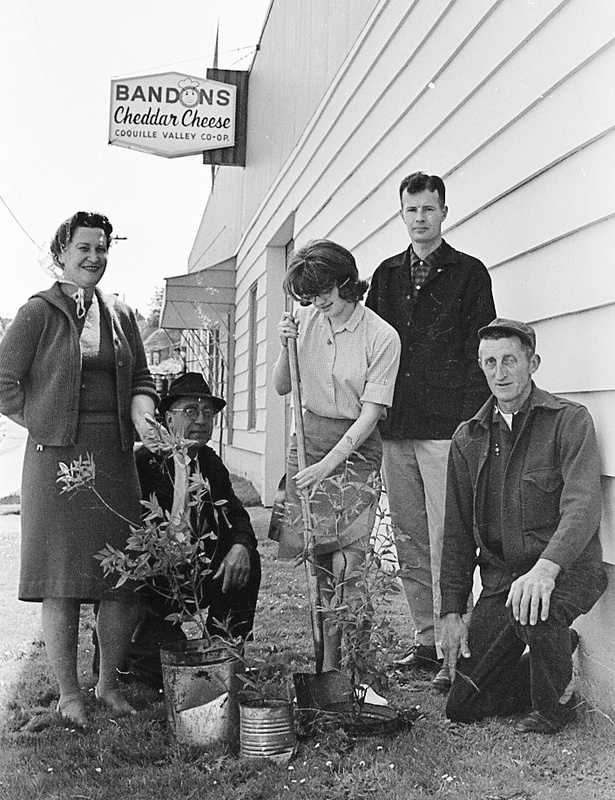 I'm not exactly sure why shrubs are being planted in front of the Coquille Valley Co-op in June of 1965, but I do know who is in the third picture. 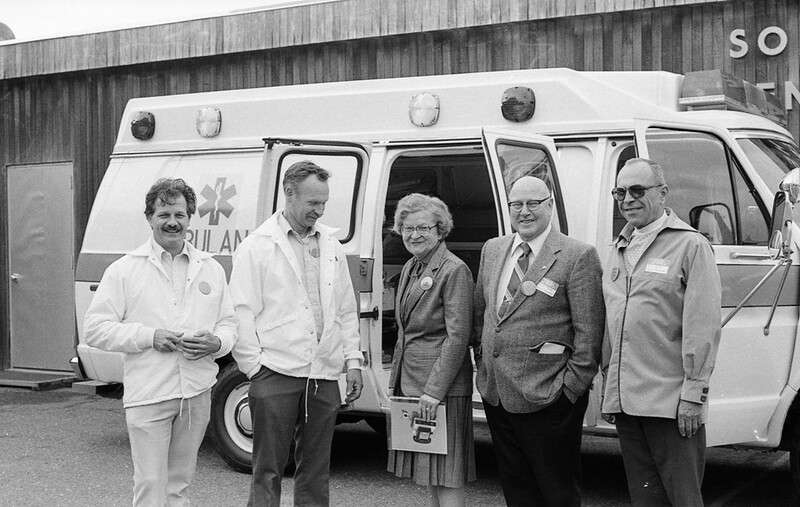 From left are Mayme Froland (who was owner of La Kris Motel), Dave Philpott, a member of the board of directors of the Coquille Valley Dairy Co-op; BHS student Roxie Seat; Jim Hanna, manager of the co-op, and Ed Woodruff, president of the board of directors. The location of this building was right along the highway, about where the new Face Rock Creamery is located. Several things occurred this week that were definitely newsworthy. The first, a huge sink hole in Highway 42s about five miles east of Bandon, was covered thoroughly by Western World editor Amy Moss Strong. But in case you haven't read her story, posted on line, here is what happened: shortly before 10 o'clock Wednesday night, a 50-foot sinkhole, said to be at least 10 feet deep, opened up on the east lane off the highway. The first car, driven by Susan Ford of Fat Elk Road was able to skirt around it, but her car apparently hit part of the highway, causing her vehicle to overturn, and roll over before coming to rest in a ditch, where her driver side airbag deployed. She was injured and taken to the hospital by ambulance. She was able to turn on her hazard lights in an attempt to warn other drivers, but apparently not in time as an SUV, reportedly driven by Tommy Hunter of Coquille, ended up in the bottom of the hole. Fortunately, he was able to get out of his vehicle and was standing along the road when another car crashed into the hole and landed on top of the first vehicle. There seems to be varying stories of how many people were transported to the hospital, but at least we know the injuries were not life-threatening. It could have been so much worse had Hunter not been able to get out of his vehicle. Photos which accompanied Amy's article on Facebook show the vehicles stacked up in the hole. It's a frightening scene to say the least. I am sure she will have those photos in the Western World this week. Darrin Neavoll of ODOT sent out an email Saturday evening, which said that they were on track to have the road open on Monday (April 15). Earlier he said they needed to install a four-foot diameter pipe in the bottom of the washout, figuring it would take about 1,000 yards of material to get it back together. Last Tuesday afternoon, we were advised that several areas of town, including Beach Loop and Seabird, were without electricity, and no one seemed to know why as we were sure it wasn't weather related. It appears that a large bird, probably an Eagle, was carrying a Pacific Lamprey by its talons ... and dropped it on our electric lines, basically switching off two sections of town. Our hydro-electric superintendent Jim Wickstrom shared the photos with me, and I will try to share one with my column, but I don't know if it's possible. I would guess the Lamprey to be about two and a half to three feet long, and the picture shows it draped over the device that picked it out of the lines. I can only imagine what it would be like to be driving, or heaven forbid walking, along Seabird and have a creature of that size dropped on your car window .... or your head. The police department's new drug dog was put to good use recently during a traffic stop, involving two men out of Myrtle Point and Medford, when he was responsible for hitting on $10,000 in cash, which allegedly had the odor of a substance, suspected to be heroin, according to Sgt. Larry Lynch. A search warrant was also requested to search the car further. The cash, seized as a civil forfeiture, was believed to be part of the sale or distribution of narcotics, and was turned over to the South Coast Interagency Narcotics Team as part of the inter-governmental agreement between the two agencies. In an attempt to work with the Oregon Department of Transportation to get some kind of a safety light/beacon at the 9th Street crosswalk, City Manger Robert Mawson and I will be meeting with three ODOT engineers on Tuesday. It is clear that the votes are there to scrap the Road Diet, but we will continue to meet with the state to address the biggest safety issue, which remains the 9th Street crosswalk. Several events have been planned locally for Easter weekend. On Saturday, April 20, there will be an Easter parade on the Pedway in front of Olivia's Cottage beginning at 10 a.m. for children, parents and grandparents. That afternoon, the Bandon Lions Club will host their annual Easter Egg Hunt for children 10 and under in City Park, beginning at 1. I received a call from Southern Coos Hospital CEO Amy Fine this week to talk about the loss of Dr. Megan Holland, who is leaving the Southern Coos Hospital and Health Center clinic. A letter sent to her patients is not clear why she is leaving the clinic nor where she plans to open a new clinic, but Fine said the hospital's clinic would remain open with two family nurse practitioners, including Debra Guzman and Amy Hinshaw, to help care for Dr. Holland's patients. Dr. Noel Pense, the district's hospitalist, will also have a limited practice at the clinic, according to Fine, focusing on osteopathic manipulation. Dr. Babak Baharloo, the district's podiatrist, will also continue to work out of the clinic. "We are looking for another MD or a DO to fill the position," said Fine. "We want to continue to take care of the community." I have heard a number of people express concern about Dr. Holland leaving the clinic as she has many patients here and is highly regarded. I attended the service at Holy Trinity Catholic Church for Pete Goodbrod Saturday. It was a beautiful service, and the church was filled with the many friends Pete and Joan have made over the years. The best part for me was seeing people like Ron Sutherland, Bill Burgher and Pete Richert, who I had not seen in quite a few years, even though I communicate with a couple of them via email. Of course, it was wonderful to see Michelle and Cindy, and Michelle's extended family. It's sad that we only seem to see each other at funerals, or at an occasional all-school reunion, but the older we get, the more often that will happen. So we need to enjoy each other when we can. 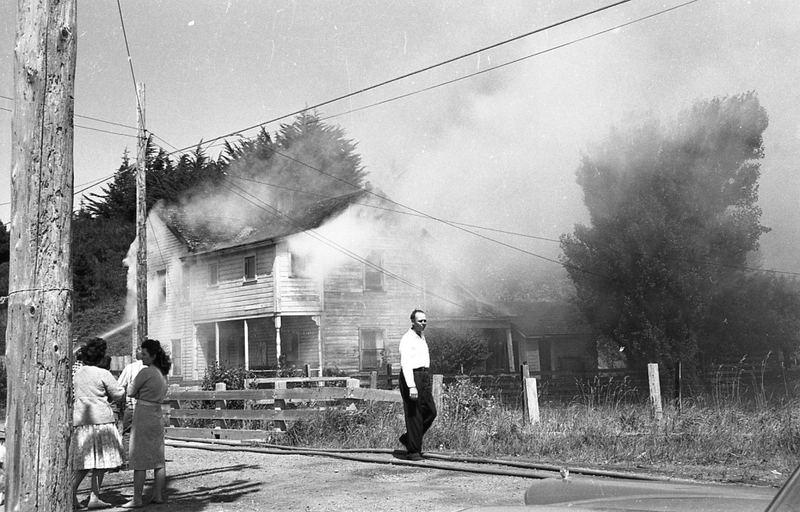 The first picture I am sharing this week was taken in 1962 as firemen battled a blaze at the Coats house on Creek Street. You've probably never heard of Creek Street, and that's because it pretty much no longer exists. 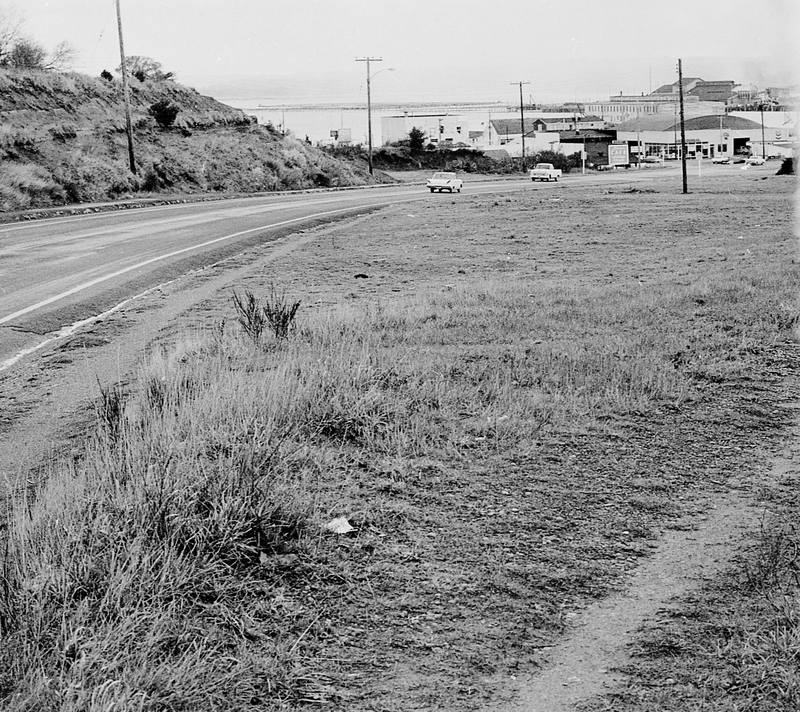 In those days, Creek Street ran from Highway 101 over to the foot of Caroline Street; and the Coats house was on the east side or Creek Street. Across the street were a number of small houses. Today that is the property occupied by the city's wastewater treatment (sewer) plant. When you access the Station Restaurant from the driveway across from Face Rock Creamery ... that is what is left of Creek Street. The second picture was taken before the Fire of 1936, probably sometime in the '20s, but I don't know for sure. When you blow up the picture you can easily recognize W. J. Sweet, at left, in front of the Bank of Bandon building. Next to him is Archie H. Rosa and at right is Frank Fahy. All three men worked at the bank in those days. W. J. was bank president from 1938 until 1960. 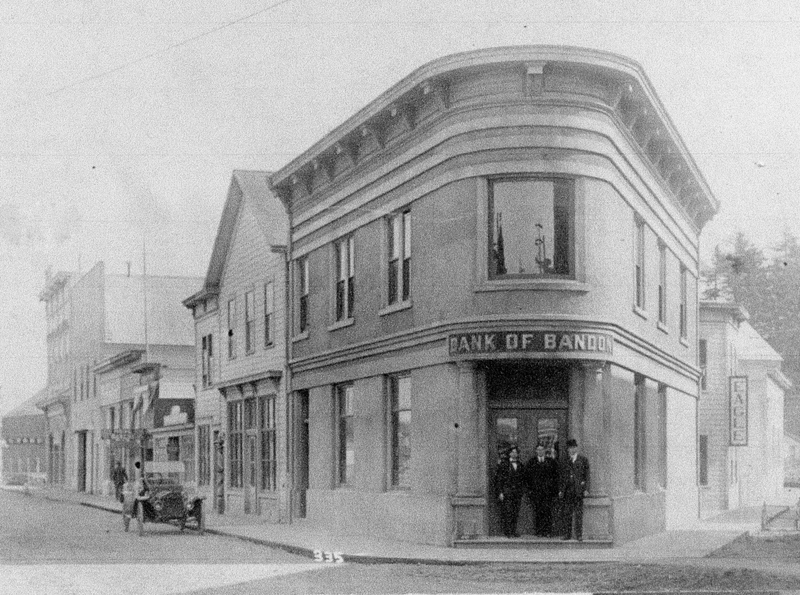 The Bank of Bandon has quite a history. On Nov. 25, 1904, six men founded the bank, which was capitalized with $25,000. They were J. L. Kronenberg (Jean and John's grandfather), F. J. Fahy, T. P. Hanly (later W. J. 's father-in-law), Frank Flam, James Denholm and George P. Topping, who was mayor from 1914 until 1923. The men built the triangular building at the foot of Oregon Avenue in 1911 (across First Street from what is now the Port of Bandon's marketplace building). It burned in the Fire, and they moved into what had been the home of the First National Bank (now the Masonic building) which survived the Fire because of its masonry construction. Bank of Bandon remained in the First National Bank building until Dec. 11, 1950, when it moved to its new headquarters at 10th and Alabama (behind what is now Banner Bank). 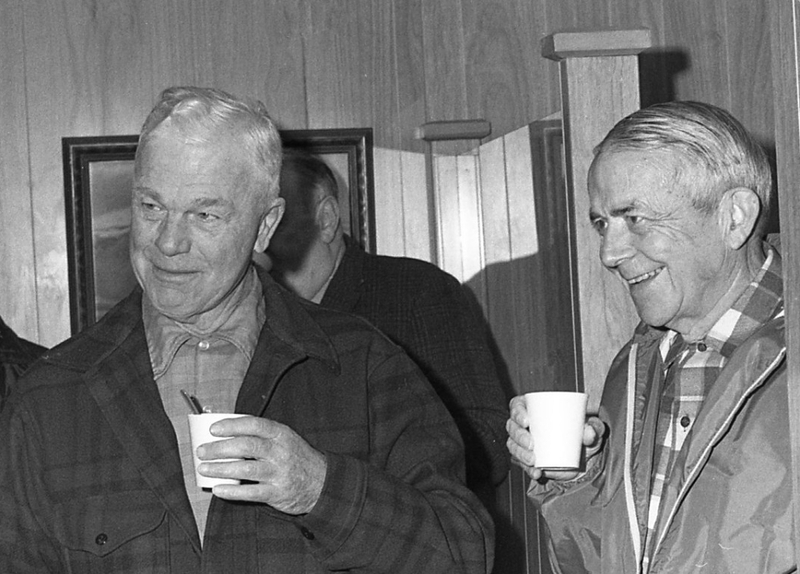 I love this third picture, taken in 1971, of two of my favorite people, long-time city manager (manager of utilities) John Fasnacht, left, and George Kronenberg, who originally owned George's Electric and later Kronenberg & Waldrop Insurance. Both men were pillars in the community. I can barely see the person behind John, but my guess is that it is Ed Capps, who was mayor at the time of the Fire. George, who served on the city council from 1944 to 1946, was the brother of Jack (J.F.) Kronenberg and the son of J.L. Kronenberg. I've been in city government for over 30 years (24 as an elected official) and I don't think I've ever experienced a week like the last one. I definitely learned one thing: you don't make decisions like a Road Diet until you make sure that everyone at least knows about the proposed change and you've researched thoroughly what the consequences could be. I will admit that I stopped looking at Facebook two days after Monday night's council meeting but people have told me some of the things that were said about me and the four councilors who voted for the Road Diet. Instead of trying to simply react and correct misinformation, I contacted the state engineer Thursday (or maybe it was Wednesday) morning to ask questions. After seeing how the thing had blown up on Facebook and from the comments I heard from people in the community who stopped me in the post office, I could tell this was not a popular decision. As they were about ready to let the bid for the restriping, Darrin Neavoll asked me if I thought they should postpone hiring someone to do the work. I had earlier told him I did not want to see our councilors recalled over a decision like this, and he agreed he did not want that to happen, so he said he would postpone the work until he heard further from the city. I believe then he talked to the city manager, who agreed that it should be postponed until at least the fall. In the meantime, I began searching Oregon Road Diets, and learned that the City of Phoenix, near Medford, had tried reducing down to two lanes, but it did not work and the council voted to return to the four-lane configuration. Then I decided to do what someone should have done earlier. I contacted Fire Chief Lanny Boston, and he had plenty to say about the proposal, and none of it was good. He pointed out that it will impact the time it takes the firefighters to get to the equipment as there will be a congested single line through town. Second when they respond with the emergency equipment they will have one secure lane to use, as the turn lane is not safe now and will become worse. Police may be able to zig zag through but with a larger truck is does not work that way. Based on the community's concerns and the information that I have learned about Road Diets in general, I have asked that the issue be revisited at the May 6 council meeting. I have also found a lot of information about flashing beacons or lights at crosswalks, and intend to further pursue that with the state, which is what the council really wanted to do all along: address the 9th Street crosswalk. As I drove back from Coos Bay the other night, I began noticing that there is a stop light at pretty much every other intersection. Why not a stop light at 9th? It would make it safe to cross the highway and it would slow the traffic...without making it more difficult for the locals to pull out of a side street. Another big decision that drew quite a few comments on Facebook was the swimming pool issue. From what I understand, of the 10 percent of the non-binding advisory surveys that were returned, 58 percent said it would be fine to build the pool in city park, while 42 percent said no. I had talked earlier with two members of the pool committee, including the new president, who basically said "why don't you just tell us to develop our own property," and that is pretty much what we did. Another board member I spoke to said they had talked about it earlier and felt there would be far fewer restrictions if they developed their own property rather than being on city property. And I agreed. This week, as a Loop supporter, I received an email advising that they have two member-at-large positions on their board. They added: "Our goal over the next three years is to break ground on our ten acres near the park. To that end we will be working aggressively to raise the funds necessary, grow public support and ensure long term viability of an aquatic center." So if you're a Loop supporter and want to be on the board, let them know. They have definitely taken the "high road." It may not happen until fall, but I understand the Rolling Pin is moving from its Old Town location to the Shindler Drug building, on the east side of the McKay's Market parking lot as they need more space for their ever-growing business. Jeff Norris and Anthony Zunino, with help from Pete Bauer, spent Thursday turning the Barn into a wonderful theater venue to host the Bandon Showcase performance featuring soul singer Luke McMaster since the Sprague still was not ready for occupancy. They borrowed lighting and other props from the Sprague and even built a stage for the event. Thanks to the use of Anthony's sound system, the concert was absolutely great. It was such a special evening that we forgot that we were sitting on padded folding chairs in the community center instead of the lush seats in the theater. Makes you really appreciate the guys who managed to pull this off so professionally ... so the show could go on. 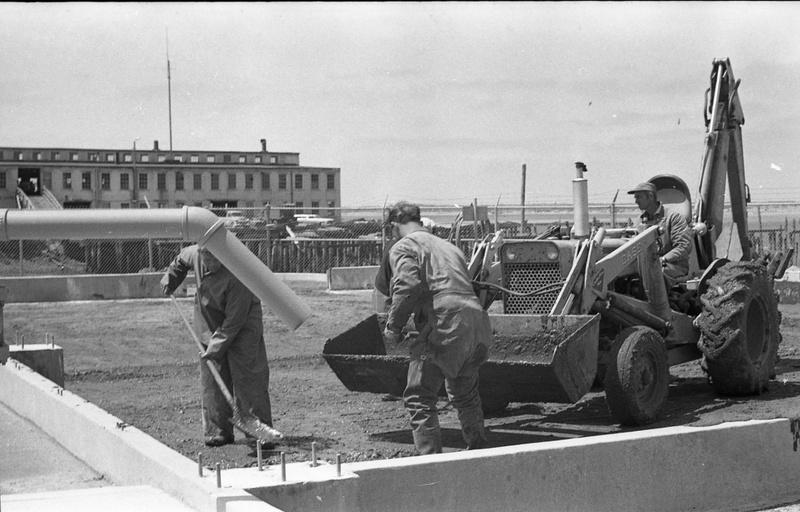 The first picture I am sharing was taken in April of 1958 as the Assembly of God church built its new addition. The church has been located at 13th and Highway 101 for many years. I have chosen the second picture because among those pictured is Dave Elliott (second from left), a long-time Bandon businessman and community volunteer, who died last week. Dave owned Dave's TV and Radio Shack in Old Town, in a building on the corner of Baltimore and Second Street, still owned by the family. For the last several years, it's been operated by his daughter, Gerry Elliott, but it has been closed for the last few months as she cared for her father. Dave was a long-time EMT on the local ambulance, and was also a member of the Bandon Volunteer Fire Department. Among his many survivors is his sister, Mary Boston, wife of Fire Chief Lanny Boston. Dave's wife Mildred died some years ago. Others in the picture, taken in front of the old hospital on the bluff overlooking the lighthouse in April of 1958, are, from left, Ken Lee, Marge Boak, Melvin Boak and Bill Cook. Mel and Bill were members of the hospital board and Marge was a long-time teacher and librarian at the high school. Ken still lives in Bandon. I wish I knew where this third picture was taken, but I am pretty sure it is in a local cafe, which may have been Bandon Cafe. 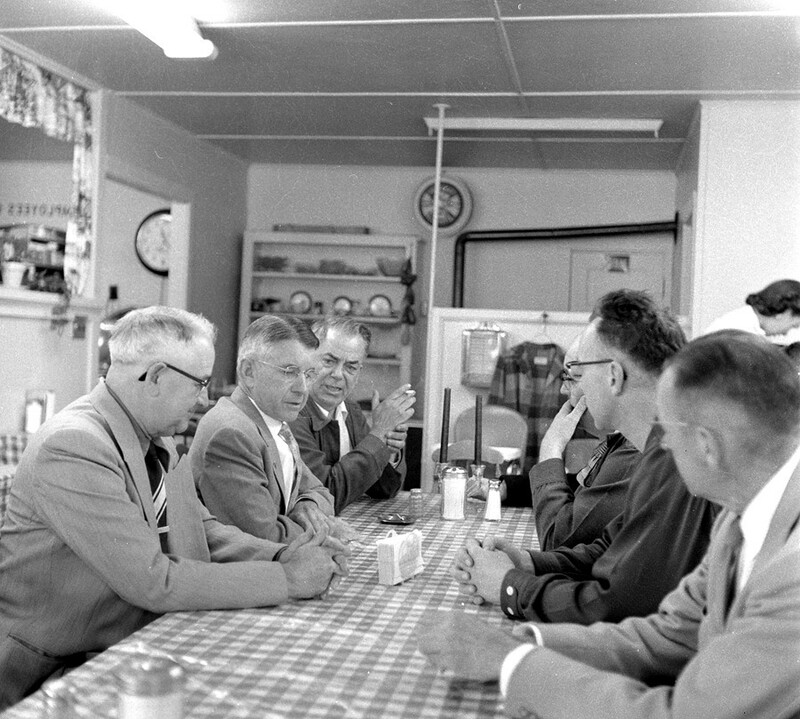 This was taken in 1956 as former Oregon Governor Douglas McKay met with a group of Bandon leaders, including G. R. "Ray" McNair, left, and Jack Kronenberg, at right. Across the table, I can see Ed Capps, far right, and his son, Edgar L. Capps, in the center. I can't identify the guy in the foreground. McKay was Secretary of the Interior under President Eisenhower from Jan. 21, 1953, until he resigned on March 9, 1956, to run for the US Senate, an election he lost by 50,000 votes. McKay was Governor of Oregon from 1948 to 1952 and had also served as mayor of Salem and a state senator. He died of a heart attack in 1959. 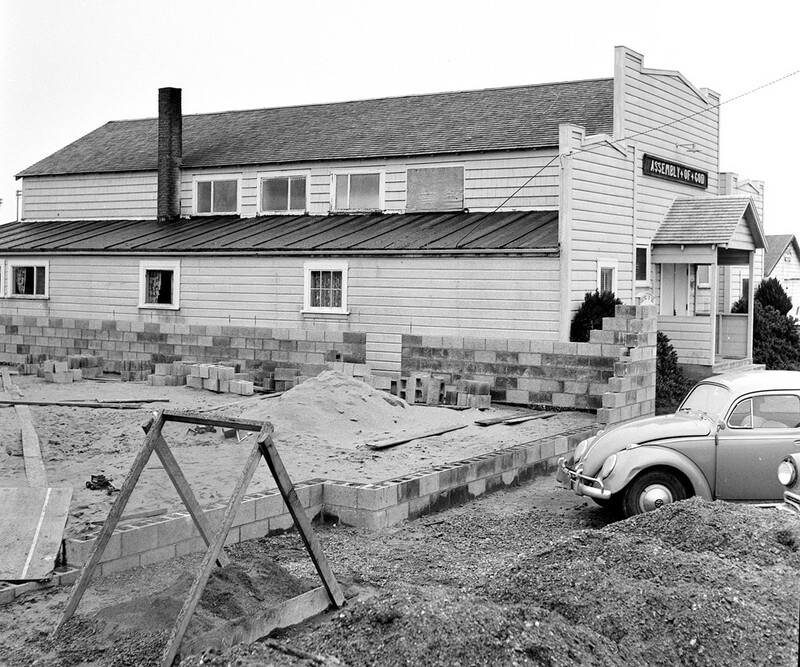 Among his many interests, Jack Kronenberg built Wecoma Baths, the saltwater natatorium on Coquille Point, which opened in June of 1925. An article in Western World explained that in addition to a business reason, Mr. Kronenberg also had a sentimental reason for building the natatorium. His oldest brother, Harry Kronenberg, had accidentally drowned in the Coquille River because he was unable to swim. That occurred in 1908 when the 19-year-old, home for the summer from college in California, was moving logs to a mill. Jack was the father of Jean Kronenberg Rittenour of Portland, who owns a home in Bandon, and John Kronenberg, who lives in Portland. I was sorry to learn that Jason James, 37, one of the twin sons of City of Bandon employee Steve James, was lost in a jet ski accident on the Rogue River last Sunday afternoon. 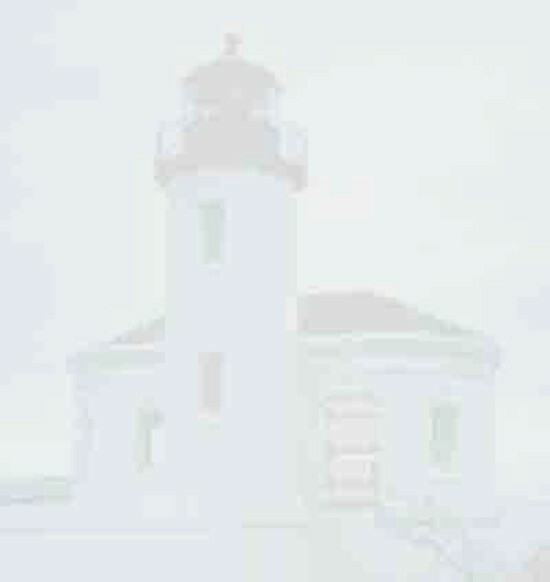 To my knowledge, his body has not yet been found. The accident occurred near Jim Hunt Creek, about five miles east of Gold Beach. According to a press release from the Curry County Sheriff's Office, James and another man, Thomas Morris, 25, also of Gold Beach, had been testing out a pair of jet skis. James was attempting to help Morris, whose ski had quit running while in the middle of the river, when his ski reportedly flipped over, and he went under water. A bystander tried to help the two men, and also ended up in the water. Two members of the Cedar Valley/North Bank Fire Department, who live across the river, witnessed the event and paddled their kayaks over. They were able to assist two of the three people, but Jason James had gone under water in the current and disappeared. Steve James is married to Lori Kreutzer, daughter of Carol and the late Ken Kreutzer. Recently the City of Bandon received a check in the amount of $2,226.00 for the first quarter 2019 Marijuana Tax Distribution. Oregon law provides localities that have not opted out of the OLCC licensed production, processing, distribution or retail sale of recreational marijuana, a shared distribution of revenue generated from the State of Oregon's 17 percent tax on the retail sale of marijuana items. City Manager Robert Mawson said there are no restrictions on the money, so most of it has been budgeted to help support the Bandon Police Department's drug dog. "If a dispensary opens within the City, we would be entitled to additional revenue from the State," Mawson said. Two Myrtle Creek men were granted a permit to open a recreational dispensary in east Bandon in the building formerly occupied by Takashi Haruna and later by Gibson Graphics. To date, it has not opened. As an interesting side note, once recreational marijuana became legal in Oregon, it was necessary to obtain a drug dog which was NOT trained to hit on marijuana, but rather on illegal drugs. I checked the county elections website to see who had filed for the various seats on boards and commissions. Unfortunately it does not tell you whether the person filing for the seat is the incumbent, so in some instances I am just not sure. But here is what I found. Five people: Ryan Sherman, Marie Simonds, A.J. Kimball, Breanna Quattrocchi and Greg Looney are running for the five vacant seats on the school board. 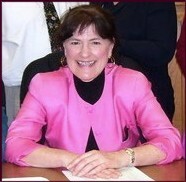 There will be a change on the Bandon Port Commission as commissioner Kelly Miles did not file for re-election. Instead Brian Kraynik filed for the seat. Incumbents Wayne Butler and Donny Goddard also filed for re-election to their respective seats. On the board of Southern Coos Health District, incumbents Esther Williams and David Allen filed for their seats; Brian Vick did not seek re-election and two people, Edie Jurgenson and Maggie Lowery, are running for the vacant seat. Running unopposed for the three seats on the Bandon Rural Fire Protection district are Amy Jenson, Stuart Hoggatt and Robert E. Dyer. Unopposed for the two seats on the Bandon Cranberry Water Control District are Kristina Campina and Gary W. Pullen. I was so thrilled to see the University of Oregon women beat Mississippi State 88-84 for the chance to go to the Final Four ... for the first time in program history. Their next game will be Friday in Tampa, Fla., when they meet the winner of Baylor and Iowa, who play Monday night (April 1). Stanford and Notre Dame also play April 1 to see which team makes it to the Final Four.